This is going to be my first article of a series of how to fish for tarpon. 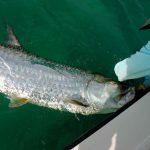 This article is more of a basic tarpon 101 dedicated to the guy that has never tried or hasn’t done much tarpon fishing and wants to learn enough basics to get out there on his own and have a shot at a hooking up. Tarpon can be a very technical fish to catch, but a few general tactical pointers can go a long way. As a fulltime Tampa Bay tarpon fishing guide for the last 20 years, I feel like I have tried just about every rod and real combination under the sun. I do carry a wide variety of rods from 5 1/2 to 12 ft and a wide range of spinning and conventional reels everyday aboard my boat for different specialized tactics that I use. This is really not needed for most people and definitely not for beginners. I find 80% of the time I am using a stout 9ft spinning rod loaded with 65-pound test on a large spinning reel that’s able to handle 400 yards of braided line. If all you have is a 7 1/2 ft or 8 ft rod that will work too. I like a little longer rod for casting distance. For a little extra casting distance you can drop down to 50-pound test, but I don’t suggest going any lighter. DO NOT fish for tarpon with anything less than 50-pound test; you can’t put enough pressure on the fish. 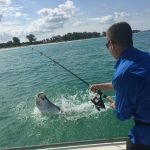 You can kill the fish from the long battle and you’re going to get in everyone else’s way as you will lose control of the tarpon and it will continually run you around other peoples boats. I prefer a very sharp circle hook 5/0 to 7/0 depending on how large of bait being used. Try not to use a hook so large the live bait cannot swim properly with it. 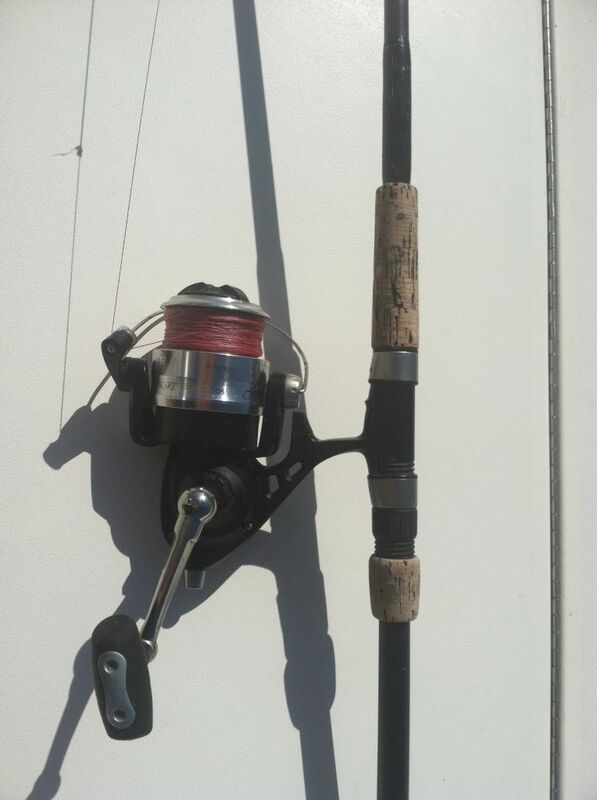 Attached to the hook are 5 or 6 ft of fluorocarbon leader. You can get by with mono as well. I generally use 60 to 80 pound test some people use a 100. I like the leader a little longer it keeps the braid from cutting into the fish during a long battle. My main line connected to the leader is 65-pound braid, which I’ve found to be perfect. It’s all you need. I primarily use three different bait when tarpon fishing in Tampa Bay. 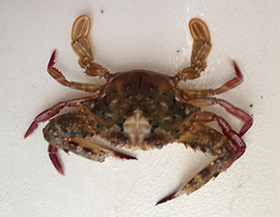 Thread fins, large green backs, small crabs, and dead bait. This may vary depending on where you are tarpon fishing, but where every you are if you can find the most abundant live bait in your area in the 4 to 5 inch range you can bet the tarpon are eating them. When I am talking about dead bait really any whole fish in that size range or a small piece will work. 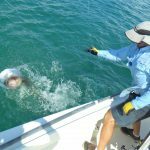 How to catch a tarpon can vary a lot depending on how the schools are moving and where they are located. When fishing for tarpon in Tampa Bay we have a variety of options. 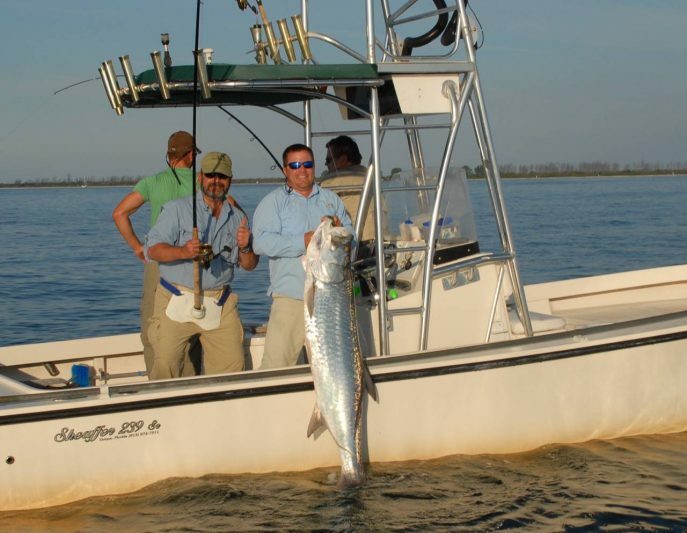 March through about November we can fish for resident tarpon that never leave the area. This is done my simply anchoring up around the bay area larger bridges and structures and drifting live bait up close to the structure. If the tide is slack or barely moving you can set dead baits on the bottom as well. Once the migration shows up tactics will change a bit. At that point we are actually sight fishing for tarpon. Generally you will be looking for a large shinny fish that proposes like a dolphin. Sometimes they are more subtle and all you may see is a little of their dorsal fin and tail break the surface. Most of this style of fishing will be done off the bay area beaches, in the passes, and in the open deeper water of the bay. The best way to fish for a school of migrating tarpon is to determine the direction they are traveling, get way ahead the school, and let the fish come to you. DO NOT approach the fish with your outboard motor running it will give them lock jaw and they won’t bit. A trolling motor is the best way to approach a school of tarpon quietly. If you don’t have a trolling motor slowly make a large loop to position yourself to where they are going then cut off you motor. Try not to let the school go under your boat as this too will generally shut down as school of feeding tarpon. Once you are in position cast your bait ahead of the tarpon as soon as you get a hit start reeling the circle hook will find its spot. Crank the drag down tight as you can without breaking the line; try not to follow the fish. Make the fish work hard to pull the line of your reel. Once the fish has taken most the line off your reel then you may run back up it again to retrieve all your line. Following a tarpon does not tire the fish, it disturbs the area messing up the fishing for other anglers and you could possible kill the fish from prolonging the fight. Remember is better to break the fish off then to tire him to death. Some of the tarpon you may hook can be 50 years old and they desire to live to fight another day like yourself. One other thing to always remember is to bow to the king. If the tarpon jumps drop you rod tip and give him a little slack it takes a little pressure of the line and you will lose a lot less fish. For beginner tarpon fisherman this may be the most important. There is a lot of tarpon fisherman out there days so pay attention to this paragraph it will keep you from a lot of arguments, possible fights, and ruining the fishing for everyone else. Most important thing to remember is to try not to spook the tarpon. If you spook a school of tarpon they generally won’t bite for 15 minutes, but sometimes as long as an hour and sometimes you never will see them again. A lot of this just comes down to common sense. Do not run up on a school of tarpon with your outboard motor running. Try to stay at least 100 yards away with an outboard at idle and 300 yards if you are on plane. Do not cut other fisherman off. If you see a school of fish moving toward another boat do not get between the two. Try not to let your boat go over top of the fish it spooks them even if you’re drifting or using a trolling motor. If an angler has a school of tarpon out the back of his boat and is following them with his trolling motor he has control of the school do not cut between him and the fish. Wait for him to hook a fish and then take your turn. If boats are on anchor drifting bait in the tide do not anchor down current from them unless it is a reasonable distance. If the current is moving fast enough a reasonable distance could be 200 yards. Anchoring down current can be dangerous with a strong possibility of the boat up current leaping a fish in your boat. Many times you will end up with damaging braided fishing line in you outboard motor lower unit. When tarpon fishing just remember do on to others as you like them to do on to you. 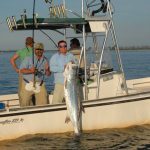 Captain Matt has over 20 years of experiance as a fishing guide and fishes from Tampa Bay to Sarasota waters. Copyright © Tarpon Fishing, 2017. Website Design & Development by Zora Creative.